Star Wars Underworld is organizing a Save The Clone Wars Twitter protest for Saturday, March 23rd at 9:30 am PST (12:30 pm EST). 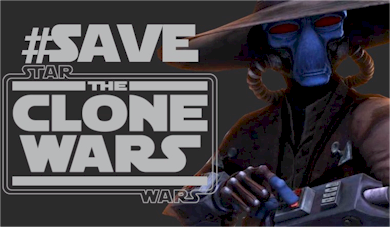 The goal is to get the hashtag #SaveTheCloneWars trending on Twitter and to prove to Disney how vast and how passionate the The Clone Wars audience is! Get ready to tweet Saturday morning and spread the word about the protest. Read their full article at StarWarsUnderworld.com.